God’s truth does not live or die on our debating ability. There is a preoccupation with apologetics in tight corners of the evangelical theological world, but the simple fact is that none of us have the skills and intelligence to directly debate Satan, outside using the “rightly divided” Word of God. This is the way Jesus won his bout with the devil in the wilderness. This is the way we will win ours. One of the problems of engaging in “theological” debate, albeit about what is falsely called “knowledge,” is that to be true to God, we can’t concede anything. Not one debating point. Jesus didn’t in the wilderness and Paul didn’t at the Council at Jerusalem, “not for one hour” (Gal. 2:5). We tend to want to be fair and gracious, not judgmental. We nod our head in the face of some pretty strange concepts in the interest of being seen as open-minded. Truth is, at all costs, we must “hold the line.” The meaning of this saying finally came to life to me upon learning about the “20th Maine” at the battle of Gettysburg. If these volunteers, under the leadership of Joshua Lawrence Chamberlain, hadn’t held the extreme flank of the Union army (Southerners, for the sake of illustration! ), the Confederates would have taken Little Round Top, the high ground, and possibly changed the course of history. We lose the high ground when we sink to Satan’s level, to engage in the “unhallowed” (unholy) and to entertain that which is hollow (empty). If the devil can effectively chip away at the truth, he wins. Paul says to Timothy, and to us, guard and defend the truth, that which is “entrusted” to all of us. Proclaim it and let it fend for itself. The truth will hold the line. 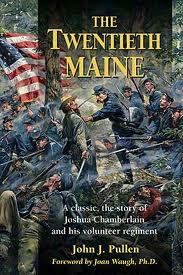 This entry was posted in Commentary, Devotionals, Principles, The Basics, The Timothy Project and tagged 1 Timothy 6:20-21, 20th Maine, Chamberlain, entrusted, faith, Gettysburg, truth. Bookmark the permalink. You know Paul wrote to others, as well as Timothy, right? Others and to us. Timothy was also supposed to pass on what he heard to faithful men, and then faithful me to others. I guess this is the answer.